Due to being busy on other projects, some important events in history were missed recently. 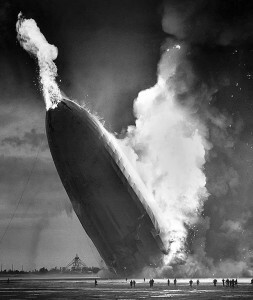 On 6 May 1937 the German passenger airship Hindenburg caught fire and was destroyed while trying to dock at Naval Air Station Lakehurst near Lakehurst, NJ. Of the 97 passengers and crew, 35 perished and one worker was killed on the ground. The event was caught on newsreel and on radio. Herbert Morrision’s radio coverage is classic and you can listen to at History.com. You can also listen to this one on YouTube which points out that Morrison’s voice was much higher than normal due to the tape recording speed (he was known for his deep voice). His actual audio report sounds different when you hear it as it ought to have been. A British Pathe newsreel of the disaster be viewed here. The cause of the accident was the ignition of a mixture of free hydrogen and air. Based upon the evidence, a leak at or in the vicinity of cell 4 and 5 caused a combustible mixture of hydrogen and air to form in the upper stern part of the ship in considerable quantity; the first appearance of an open flame was on the top of the ship and a relatively short distance forward of the upper vertical fin. The theory that a brush discharge ignited such mixture appears most probable. Mythbusters examined the incendiary paint hypothesis and concluded it did not cause the catastrophe. You can view that here. Many believe the most likely reason for the explosion is that a tiny tear in the fabric or an exposed piece of metal was the entry point for static electricity to ignite the hydrogen. Hydrogen would never be used again for airships after this. Airships faded from use though the famous Goodyear blimps over sports and other events are used to film the events below. And with the desire to conserve our environment these days, helium filled airships may yet return as a means of travel.